Larry J. Sabato's Crystal Ball » OMEN OR NOT? We can all guess the final result in New Jersey this November, and at this point most observers are less certain about Virginia’s, although we currently rate Terry McAuliffe (D) as a small favorite over Ken Cuccinelli (R) (if you missed our special Crystal Ball on Virginia from last Friday, you can read it here). But the truly sure thing about the two gubernatorial contests set for this November is the avalanche of flat predictions made about the national 2014 midterms that will flow from these two elections. On its face, such an exercise appears foolish. Gov. Chris Christie’s (R) very likely reelection will tell us more about Christie’s potential presidential candidacy than the drift of 2014. Perhaps if the GOP nominated more relative moderates like Christie, the party could become competitive again in the Northeast and on the West Coast, but that’s obvious even without considering Christie. And New Jersey is strongly Democratic territory when Christie is taken out of the equation; the Christie era isn’t going to change that — just look at the state’s October special election for U.S. Senate, where Newark Mayor Cory Booker (D) is an overwhelming favorite. Virginia, on the other hand, is newly minted swing territory, the state that came closest to the national vote for president in both 2008 and 2012. (To a longtime Virginian, this is still a stunning statement.) Thus, political observers may be more justified in spinning tales of future elections by analyzing the current contest for governor. If Cuccinelli wins in November, prepare for an onslaught of predictions that 2014 will be Tea Party II, another anti-Obama wave year like 2010. If McAuliffe triumphs, it will be seen as a harbinger of 2014 Democratic holds in key southern Senate match-ups — not to mention a positive portent for Hillary Clinton in ‘16. Granted, Virginia was not especially representative of the nation until very recently, but what does modern history reveal about its off-year forecasting powers? 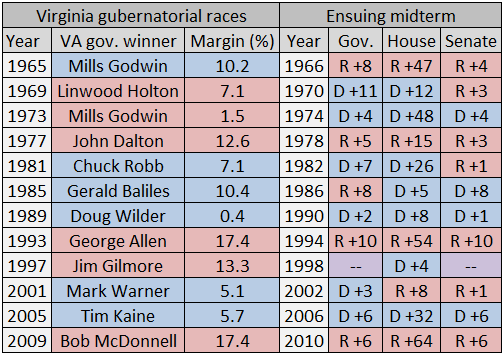 Table 1 can guide us; it is a quick look at the dozen modern Virginia gubernatorial elections compared to the outcomes in the following year’s midterm contests nationally. Note: Blue indicates Democrat, red indicates Republican. Sources: Virginia Votes, 1924-1999; Virginia State Board of Elections; Vital Statistics on American Politics 2011-2012; CQ Press Guide to U.S. Elections (6th Edition). When Democrat Mills Godwin won the governorship in 1965, Virginia was at the tail end of an eight-decade, one-party period of dominance, the last of 21 consecutive Democrats to hold the top job in Richmond. Naturally in this era, Virginia was not much of a national barometer, and Godwin’s comfortable victory in 1965 gave not a hint of the anti-Lyndon Johnson Republican wave of 1966, generated mainly by the public’s concerns about the Vietnam War (the explosive economic growth of the mid-1960s also slowed a bit around the time of the midterm). Four years later, Virginia finally became a two-party state, and the GOP’s Linwood Holton — a Richard Nixon ally who capitalized on Democratic factional in-fighting — handily won the governorship in 1969. Yet by the time Nixon’s 1970 midterm occurred, economic problems and more angst about Vietnam gave the Democrats additional U.S. House seats and governorships, though Republicans picked up a few in the U.S. Senate. Virginia’s 1973 result was even less representative of what would happen in the 1974 midterms. Mills Godwin switched parties and narrowly won a second term as governor even after Watergate had picked up steam. But Democrats secured a massive landslide nationally shortly after President Ford’s pardon of former President Nixon. At last, in 1977, Virginia held a gubernatorial election that was a harbinger of the following year. President Jimmy Carter, who had only narrowly lost Virginia in 1976, became unpopular quickly, and the GOP candidate for governor, John Dalton, won a landslide over a close Carter ally, former Lt. Gov. Henry Howell (D). (Howell had run as an independent in 1973, and the Democrats didn’t field a candidate.) In 1978, anti-Carter sentiment was more widespread, and Republicans won a modest number of additional congressional seats and governor’s chairs. The parties switched roles four years later. In 1981, Virginia Democrats won the governorship after a 12-year drought with LBJ’s son-in-law, Chuck Robb. Subsequently, in the midst of an economic downturn, Democrats did quite well in President Reagan’s first set of midterm contests in 1982. Virginia Democrats posted two more gubernatorial victories in 1985 and 1989. One could argue that Gerald Baliles’ win in ’85 suggested the Democratic takeover of the U.S. Senate in 1986, though that’s a bit of a stretch, and it ignores the fact Republicans did very well in the 1986 gubernatorial races (aided by the exit of many term-limited Democratic incumbents). And it is difficult to contend that Doug Wilder’s paper-thin victory in 1989 for governor said anything about 1990, which was an unmemorable status-quo midterm with minimal Democratic gains under President George H.W. Bush. One of the Virginia elections most often cited as a harbinger is 1993, when George Allen won a landslide as governor by running against President Clinton as much as his opponent and other state Democrats. The anti-Clinton wave crested with the “Republican Revolution” on Capitol Hill in 1994, which produced the first GOP majority in the House in 40 years and a large shift toward the Republicans in both the Senate and the governorships. Yet four years later, another Republican landslide for a Virginia governor foretold nothing about 1998. Jim Gilmore’s handsome 1997 victory was a misleading indicator about 1998, when GOP overreach on President Clinton’s impeachment robbed Republicans of a prime opportunity to build up a large Senate margin. At the same time, the GOP actually lost a few House seats — and this was Clinton’s “sixth year itch” election, when his party ought to have been vulnerable. It was turnabout for the Democrats in the next Virginia cycle. Mark Warner (D) won the governorship in 2001, but post-Sept. 11 Republicans fared reasonably well in President George W. Bush’s first midterm. Bush’s sky-high popularity made some difference in ’02 — though it had had no impact on the ’01 Virginia race. Federal and state contests can run on very different train tracks, which is another reason why comparisons between a state’s gubernatorial outcome and a national midterm can be tricky. However, the two most recent Virginia gubernatorial results have appeared to be foretokens, fueling the belief that there is a straight-line connection between one year and the next. Tim Kaine (D) succeeded Mark Warner as governor in 2005, and the Democrats took over both houses of Congress in 2006. President Bush is one of the vital links, of course. He was already down in the polls by November 2005 because of the Iraq War and his mishandling of Hurricane Katrina, and it only got worse for Bush in 2006. And in 2009, Bob McDonnell (R) scored a massive 17 percentage point knockout for governor, partly because President Obama’s ratings were sinking. The health care battle and the balky economy energized Republicans and discouraged Democratic turnout (though a weak Virginia Democratic nominee played a major role as well). One could contend that McDonnell’s triumph presaged Scott Brown’s January 2010 capture of Ted Kennedy’s old Senate seat in Massachusetts and the national Republican takeover of the House in November 2010. The crystallized summary of this nearly 50-year tour through history is less an iron rule of politics than a cautionary one: Omens can be deceptive. Of the 12 examples in our table, five Virginia elections were genuinely predictive of the next year’s midterm results. Another five were misleading indicators. The remaining two (1985 and 1989) could be argued either way. Back to New Jersey for a moment. 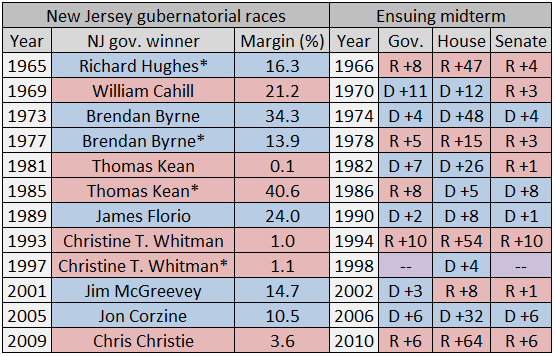 Table 2 details the gubernatorial results there since 1965. Notes: * Indicates incumbent; blue indicates Democrat, red indicates Republican. Sources: Vital Statistics on American Politics 2011-2012; CQ Press Guide to U.S. Elections (6th Edition); Dave Leip’s Atlas of U.S. Presidential Elections. As with Virginia, there’s not a clear connection between the off-off year gubernatorial race and the midterm held the following year. Incumbent Richard Hughes (D) easily won reelection in 1965, which obviously didn’t foreshadow Democratic troubles in 1966. Moderate Republican William Cahill won in 1969, becoming the first Republican governor elected in 20 years. He lost a primary four years later to a more conservative candidate, who was then swamped by Brendan Byrne (D). Byrne was certainly helped by Nixon’s troubles, but the incumbent governor’s primary defeat was a bonus to his candidacy. Byrne signed New Jersey’s first income tax during his first term, and he faced a crowded Democratic primary, along with a challenge from Raymond Bateman (R) in the fall. After a televised apology for his shortcomings, Byrne won comfortably, but by a much smaller margin than his first term. It’s a reach to call that much of a tea leaf for the bad Democratic midterm of 1978. Tom Kean (R) won a squeaker in 1981, and then a romp in 1985. The lesson here seems to be that it can be easier to win as an incumbent than in an open seat race. Following Kean’s two terms, James Florio (D) — who lost to Kean in 1981 — won the governorship in a rout in 1989, but that said little about the inconclusive 1990 midterm. Four years later, Florio lost a very close bid for reelection to Christine Todd Whitman (R); Whitman probably got a boost from the Republican swing following Bill Clinton’s 1992 election, but Florio also was hammered for tax increases. One other thing: Florio’s Democrats lost control of the state legislature in 1991; the Democrats couldn’t blame Clinton for that, because he wasn’t in the White House yet. Whitman, as the incumbent Republican, won another super-close contest in 1997. Perhaps her weak win previewed the good Democratic midterm in 1998, but that’s probably a stretch. Jim McGreevey (D), the 1997 loser to Whitman, won the open governorship comfortably in 2001, which said nothing about the pro-Republican 2002 midterm (or about Bush’s popularity post-9/11). Four years later, and after McGreevey had left office following scandal (and his coming out as gay), Jon Corzine (D) won in 2005 over Doug Forrester (R) — both candidates were wealthy self-funders. Corzine was probably helped by a national backlash against President Bush in a Democratic state. Four years later, with less favorable political winds and after a rocky first term, incumbent Corzine lost to Chris Christie (R). Realistically, only four of the 12 races — Byrne in 1973, Whitman in 1993, Corzine in 2005, and Christie in 2009 — can be considered bellwethers for the following year’s midterm. The key question in the Garden State’s sleepy gubernatorial race seems to be whether Chris Christie can win over 60% of the vote, as some polls have indicated. It’s possible, but it might be a bridge too far for the popular Republican governor, if only because of New Jersey’s strong Democratic tilt. Kean, in his reelection waltz in 1985, won more than 70% of the vote. That’s unrealistic for Christie in a more polarized era, even though he’s facing a weak opponent (Democratic state Sen. Barbara Buono). And Kean was more liberal than Christie is now, so more non-Republicans felt comfortable voting for Kean. A fair benchmark for Christie is probably 55%-60%, but even if he finishes below that, it’s unlikely to really matter all that much as he invariably becomes more of a national figure (and Republican presidential possibility) in a second term. The polling average at HuffPost Pollster shows Christie at 56.1% of the vote; the RealClearPolitics average has him at 54.7%. The New Jersey and Virginia gubernatorial races are basically the only political games in town this fall (with apologies to New York City and its mayoral race). As such, there will be an irresistible impulse among the chattering classes to over-interpret the results, particularly in swing-state Virginia. Historically, though, these races haven’t told us much about the midterms that followed. It behooves us to be cautious about drawing national conclusions come November. And in the excitement of the Nov. 5 outcomes, we expect to pay little mind to our own warning. Hypocrisy, thy name is Crystal Ball.